Sign up and receive Property Email Alerts of Houses for sale in Vorna Valley, Midrand. This stunning home offers a trendy feel set in a well-established, boomed-off street in Vorna Valley which has 24-hour security. The home is well suited for a young family looking for a secure environment without compromising on privacy or space. - 3 sunny north facing bedrooms all of which are fitted with laminated wooden flooring. The main and second bedrooms have built in cupboards while the 3rd bedroom is fitted with a built-in study / work desk ideal as a home office. - 2 neat bathrooms as well as a guest toilet. The family bathroom offers a bathtub while the main en-suite bathroom comprises a bathtub and shower. - With full-length windows, the large open-plan TV lounge and dining area have great views of the beautiful garden and pool area. The living area has laminate wooden flooring and boasts a face brick feature wall. A centrally located Jetmaster fireplace makes this the perfect social area during colder months. - Stylish kitchen with screed flooring and Smeg gas stove. The kitchen is fitted with modern granite counter tops as well as an incorporated cutting board / butcher's block. A round breakfast nook is on offer for meals on the go. The large separate scullery offers ample storage & space for laundry appliances. - The covered entertainment patio is a host's dream. The patio is fitted with a custom-made bar and serving counter as well as a great area for an outdoor dining table. Included is a corner lounge which doubles as storage for swimming pool equipment. - Double automated garage with built-in cupboard storage. The paved driveway offers additional parking space for visitors. - A large swimming pool is centrally located in the back yard and the private garden offers an enchanting space for children to play. The flower beds are fitted with water misters. - The property is located within a security boomed street. In addition, the property is fitted with a full alarm system and CCTV for additional security. - The property is packed with extra features such as a home automation system for the lighting and geyser which allows remote controlling and scheduling via mobile or browser. There is also an inline water filter, pre-paid electricity meter, fibre optic network connection and more. - The property is packed with extra features such as a home automation system for the lighting and geyser which allows remote controlling and scheduling via mobile or browser. 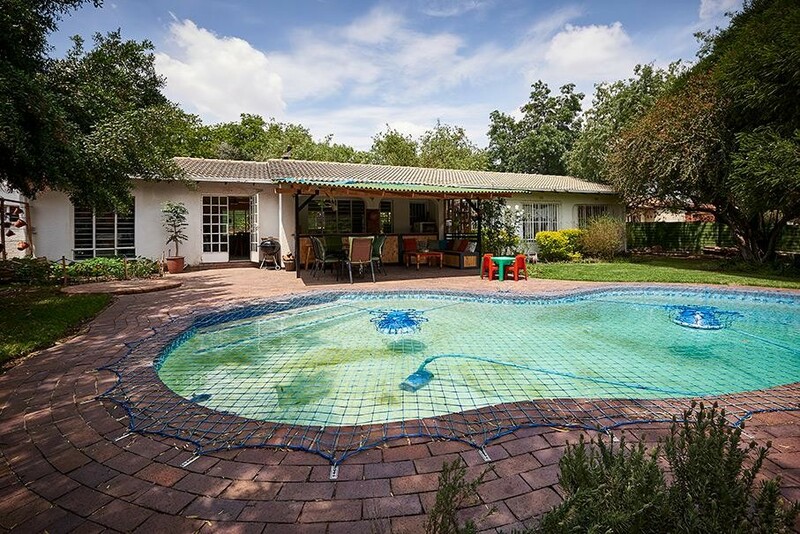 Sign-up and receive Property Email Alerts of Houses for sale in Vorna Valley, Midrand.